Silver has a history of undergoing massive spikes that look more like a heart rate chart than a stock or commodity chart. Due to silver's conductive and reflective properties, it has been considered a strategic metal for industrial uses since the introduction of electronics. It is the only commodity that has a users' association lobbying for the organizations that consume it. Industrial use of silver has been relatively stable; however it is important to note that industrial use of silver has been greater than or near equal to production – which has thinned the market probably more than any other commodity. The reason for this is that both mining supply and industrial production have been near equal and stable. What is left at the margin are investors and speculators who are setting the price – not based upon 600-800 million ounces in global production or consumption, but 50-100 million that is the remaining marginal amount that buyers and sellers can get their hands on. When investors aren't buying, the silver market is as calm as a pool of stagnant water. However, when investors seek protection from inflation, investors line up in a very thin market to produce shock waves. During the inflation panic of the 1970's the Hunt Brother accumulated a position of around 100 million ounces of silver. They started by taking physical delivery, however they continued buying futures contracts until the price of silver spiked to $50 in January of 1980. The COMEX, then changed the exchanges rules to only accept liquidation orders, and the price of silver subsequently collapsed to the $4 area. Gold trader Jim Sinclair was involved in the liquidation for the Hunt Brothers and still seems fearful of what he witnessed. Global central banks eased the money supply and credit in reaction to a recession in the US. This led to a return of inflation fears, and silver spiked from $5 to $14.72 in 1983. In the aftermath it fell back to the $4 area. A decrease in global silver supply, along with economic concerns led to another spike from $5 to $11. It once again fell to the $4 area. According to reports by Martin Armstrong, and an anonymous trader on ZeroHedge, PhiBro, a trading arm of Solomon Smith began to accumulate futures, and exercise out of the money call options to take delivery through Republic Bank. The CFTC approached PhiBro, and demanded to know the buyer. PhiBro never revealed the buyer, but was quickly forced to reverse the trade. The net effect was a small blip of the silver price in the $5 area. Although it wasn't revealed, there are reports that the buyer was Warren Buffett. In a similar replay to 1995, Phibro began entering large call option orders through Republic Bank, except this time the buyer takes delivery in London, out of the jurisdiction of the COMEX. In both 1995 and 1998 out of the money calls were purchased and later exercised. The word was leaked that the buyer is Warren Buffett and other traders begin to accumulate positions. Armstrong claims that Republic Bank tried to make it look like he was the buyer; however US regulators tracked the positions to London and discovered it was indeed Warren Buffett who had taken delivery of 87 million ounces with intent to take nearly another 42 million ounces. Buffett publicly announced the investment stating “In recent years, widely-published reports have shown that bullion inventories have fallen very materially, because of an excess of user-demand over mine production and reclamation.” Silver spiked from $4 to 7 and fell back to $4 again. Buffett never spoke of silver again until 2006 when he admitted he sold it shortly after buying it in when he was quoted as saying “I bought it very early, I sold it very early. Other than that it was perfect”. It is believed that regulators strong armed Buffett into selling the silver back with the threat of being targeted as a manipulator. It is not believed that Buffett had the intent to flip silver for a small profit, nor that he was attempting to manipulate the price. Given the fundamentals of a long term supply deficit and depletion, in conjunction with negative interest rates, silver could no longer be held at $4 an ounce when it cost $6-$8 to produce it. An inflationary boom launched all commodities into a bull market. This time though, buyers were not a billionaire or large hedge funds. Instead small investors and smart money bought silver based solely on its fundamental value. Price spikes were mitigated such that both gold and silver rose in a measured slope. In early 2008, the financial markets began to collapse with the dollar. Speculators were beginning to attack the world's reserve currency and silver hit a peak of 21. It remained at high level until the summer of 2008 when a large amount of silver was shorted. Numerous reports indicate that these trades were being made through JP Morgan, which is also the custodian of the SLV silver ETF. Gold was also shorted in conjunction with a swap of Euros for dollars. The effect was an immediate reversal of a large dollar short trade, collapse in precious metals and the subsequent crash of 2008. Silver fell to the $8 level. 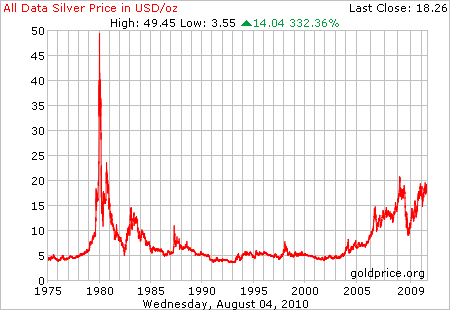 Inflationary policies quickly pushed gold to new all time highs, and silver back up to the $19 level. The structure of the precious metals markets have changed substantially from small value buyers and smart money to larger and more influential institutions and hedge fund managers such as John Paulson and George Soros. This is the classic description of the second phase of the bull market. However, the focus of these funds remains gold. The word is out amongst large investors on the street to avoid buying silver or be made an example of. There is one thing common amongst billionaires - they all have a lot to lose and must maintain a co-existence with governments and bankers. As Armstrong has pointed out, no one has survived a run on silver. The Hunts were bankrupted, and Buffett only escaped by immediately closing out his positions. Buffett won't speak of it again, and two of the best known gold traders – Jim Sinclair and Martin Armstrong – not only avoid trading it, but even discussing it. It is unlikely that another billionaire will attempt to take delivery of 50 or 100 million ounces of silver again. However, the recent bull market has clearly been base building, similar to what was seen in the 1970's prior to the 1980 silver spike. The larger the base, the larger the spike - and the 1970's silver base pales in comparison to the 2000 base. When the next spike does occur there may only be one short seller, but there will be thousands of marginal physical buyers that have simply lost confidence. There will be no Hunt Brother or Warren Buffett to call up and threaten or strong-arm, and there will be no one to reverse the trades on. It will be the public, or small retail investors acting in panic.